US officials are stepping up their response after a deadly wave of parcel bombings in Austin, Texas, by offering $100,000 (£71,000) for information. The new reward, announced on Sunday, comes on top of a existing $15,000 being offered by the state`s governor. Two people have been killed and two others injured in three blasts from packages left on doorsteps this month. Later on Sunday, police responded to another explosion in the south-west of the city. It is unclear if the latest incident, in which two men were injured, is connected to previous attacks. Residents have been told to stay indoors until police declare the area safe. Both of the men killed earlier this month were African Americans and police have not ruled out racism as a possible motive. 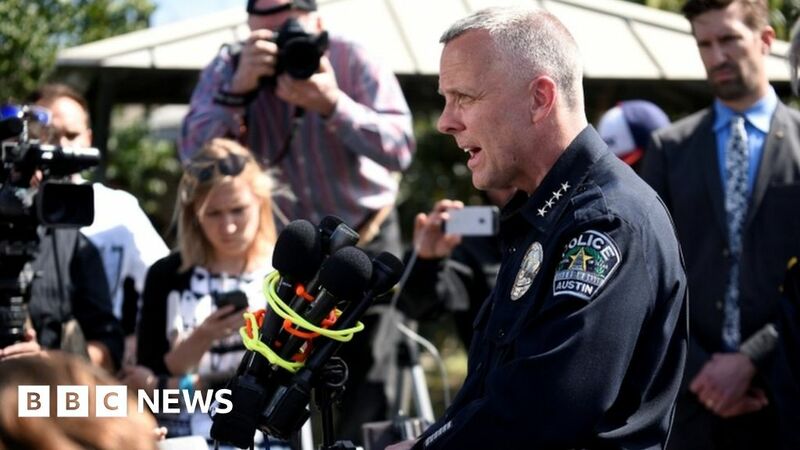 Austin police chief Brian Manley told reporters he believed the attacks were "meant to send a message". Mr Manley announced the new $100,000 reward, offered by US federal agencies. He also re-issued a warning to the public to not touch any packages they were not expecting. "Not a single one of these bombs has exploded without being handled," he said. Hundreds of federal agents are helping local police, but there has been no arrest. Authorities say they have responded to 735 reports of suspicious items since last Monday. The first bomb exploded on 2 March, killing Anthony Stephan House, 29, at his home. Two more bombs exploded 10 days later, and were linked to the initial blast. Draylen William Mason, 17, was killed when he brought a package inside his home. The explosion also critically injured his mother. Hours later a 75-year-old Hispanic woman was injured by another package. Local media reports this may have been intended for someone else. They were due to perform at the city`s South by Southwest festival, known as SXSW.